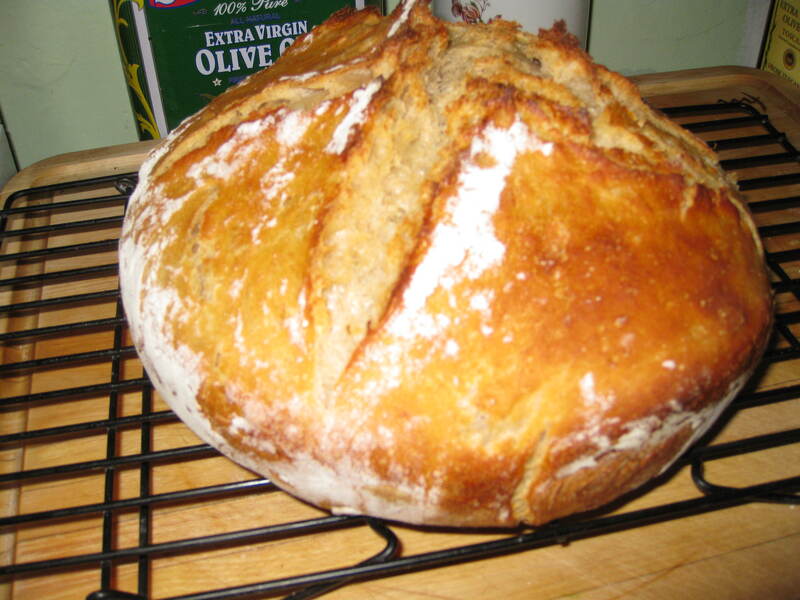 I know I’ve blogged a million times about no-knead bread, but this one was so beautiful I just had to post a photo. I started with about a cup and a half of leftover mashed potatoes. Then I added 3 cups of flour, a 1/2 teaspoon of yeast (I’m at the bottom of the jar and it’s not very lively anymore), a tablespoon of salt, and mixed it until the mashed potatoes were all incorporated. Then I added 1.5 cups sourdough starter and 1 cup of warm water. It was a little wet, so I added half a cup of whole wheat flour. It was definitely a “wet shaggy dough” as the recipe describes. I covered it with plastic wrap, and left it overnight. When I got home this morning it had risen to the top of the bowl. Sourdough starter seems to really like mashed potatoes — I’ve had that happen before. It was a really really wet dough — I had to add some more flour and use the pastry scraper to shape it into a boule. But look what happened? It gained enormous spring once I put it in the oven — this loaf pretty much filled up my Le Crueset pot. It’s by far the nicest loaf of bread I’ve made in a while, which means it’s going to be interesting around here in the morning as someone likes mashed potato in his breakfast burrito, and I might start hoarding the leftovers for bread.